Structural problems in a Ontario crawl space, such as settling columns, sagging beams, or fatigued floor joints are all common in a crawl space. 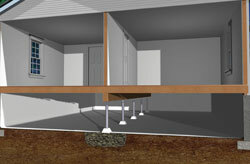 Settling columns in a crawl space often occur because of the presence of weak supporting soils underneath that are unable to bear the weight and pressure transferred through the house. Over time, these weak soils can begin to settle and shift with changes in soil density and moisture content. As the columns and beams move out of position, the floor above can sag and the house structure can weaken. Sagging floor joists and beams can also be caused by improperly spaced crawl space pier columns. When placed too far apart, these beams can be overloaded, which causes bending and sagging. This leads to sagging floors above, wall cracks, and a variety of other crawl space or foundation issues. If you'd like a free, no-obligation foundation repair estimate in Chatham, London, Sarnia, Windsor, Stratford, Windsor , Leamington, St Thomas, Amherstburg, Strathroy, Essex, Ingersoll, Kingsville, Aylmer, Goderich, Hanover, Listowel and the surrounding Ontario area, call or contact Advanced Basement Systems of Ontario today! Ripping out and rebuilding the crawl space isn't necessarily the best option for crawl space repair. There are many installations that can be done in about a day that will both reinforce the structure and possibly return the floor to its original position. 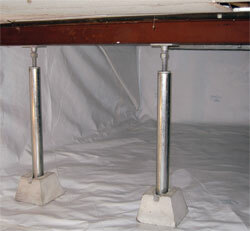 Some contractors will use concrete columns and shimming to create a system of solid, rigid support in the crawl space. However, these concrete columns are time consuming to create, and it's necessary to wait while the concrete cures to continue work. These columns will not be adjustable, and once installed, they cannot return the structure to its original position. The soil below the columns will continue to sink over time, and the homeowner will need to continually install new shims while the damage slowly continues to worsen. Crawl space jacks, such as the SmartJack® provided by Supportworks, are adjustable metal beams that are easily and cost-effectively installed in a crawlspace. To install a crawl space jack, a hole is first created, and a solid base of engineered fill is established under the location of the jack. A pre-cast concrete base is placed on the fill, and the crawl space jack is mounted on top. After installation, the system, can then be tightened and adjusted to secure the support and help to lift the floor beam above. Crawl space support jacks work by transferring the load of a house from the beams and sending it downwards into the existing soils. They're stronger, cleaner, better, and faster to install than concrete beams, and they're fully compatible with a crawl space encapsulation system. Heavy-duty jack posts made with galvanized steel, such as the Supportworks SmartJack® Crawl Space Support System, are the strongest, most corrosion-resistant crawl space structural supports available in Ontario. The SmartJack® is able to hold well upwards of 50,000 lbs of weight per brace and is easily adjustable to restore a home's structure and property value. A base of engineered fill in installed under each support, and they are able to be installed with no need for additional shimming later. Contact Advanced Basement Systems of Chatham, ON for a Free Estimate on your crawl space foundation repair in the Chatham, London, Sarnia, Windsor, Stratford, Windsor , Leamington, St Thomas, Amherstburg, Strathroy, Essex, Kingsville, Ingersoll, Goderich, Aylmer, Listowel, Hanover and the surrounding Ontario area!